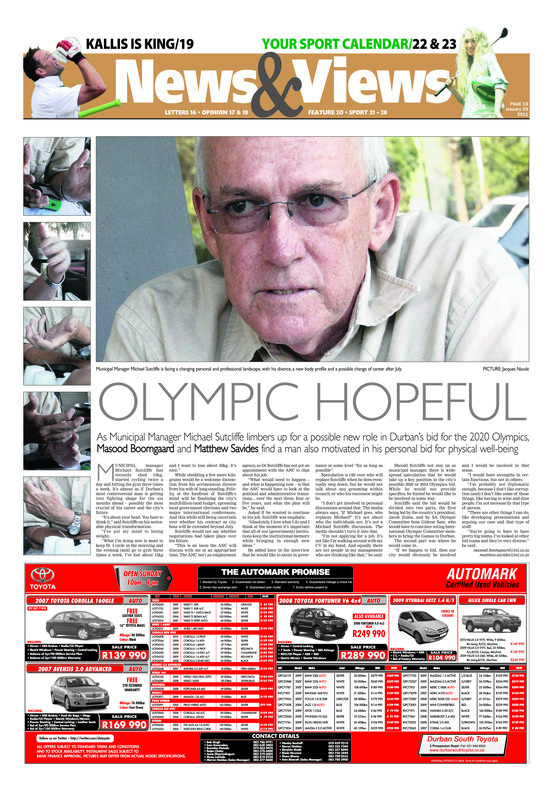 This is the page one lead from the Sunday Tribune this week, written by myself and Masood Boomgaard. 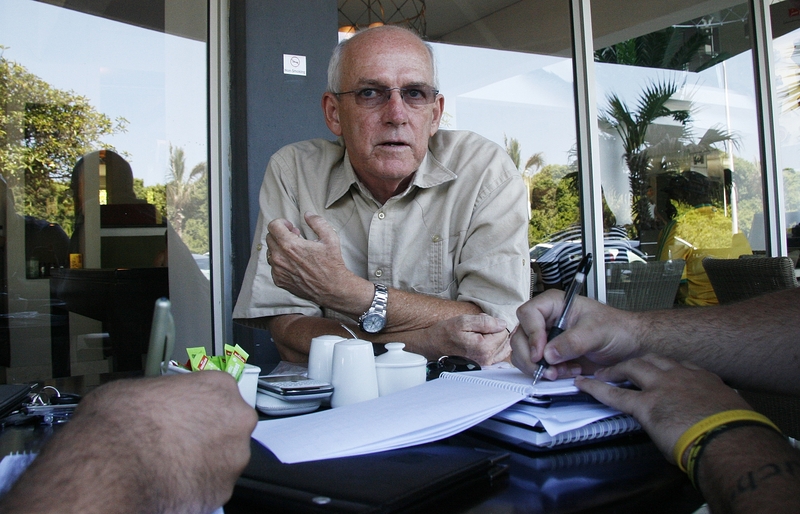 We chatted to eThekwini municipal mnaager Michael Sutcliffe about various things, including his future. It was accompanied by a second background piece, where he speaks in more depth about a few topics. MICHAEL Sutcliffe wants to stay on as city boss. His contract expires in July, but Sutcliffe has given the clearest indication yet that he would not hesitate to extend his reign as eThekwini municipal manager. – Hosting more than 50 000 delegates – including heads of states – at the International Olympic Committee meeting in July and the United Nations climate change summit in December. 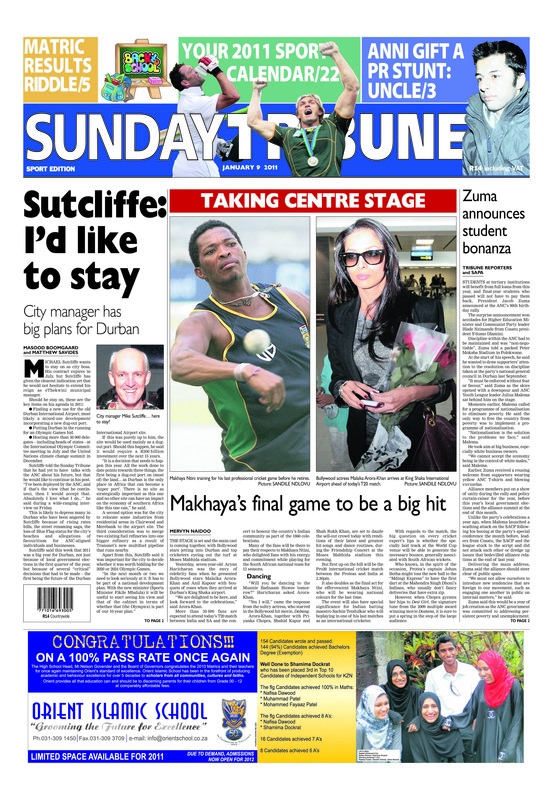 Sutcliffe told the Sunday Tribune that he had yet to have talks with the ANC about his future, but that he would like to continue in his post. 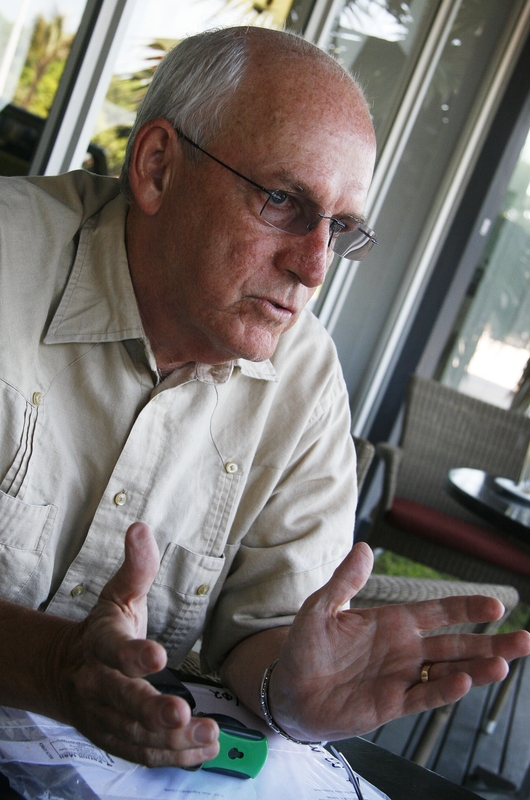 “I’ve been deployed by the ANC, and if that’s the view (that he continues), then I would accept that. Absolutely. I love what I do…” he said during a wide-ranging interview on Friday. This is likely to depress many in Durban who have been angered by Sutcliffe because of rising rates bills, the street renaming saga, the loss of Blue Flag status for the city’s beaches and allegations of favouritism for ANC-aligned individuals and businesses. 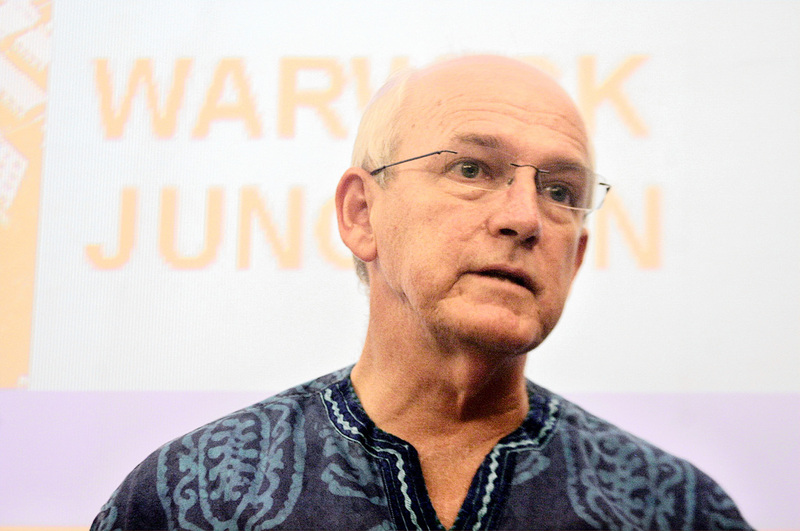 Sutcliffe said this week that 2011 was a big year for Durban, not just because of local government elections in the first quarter of the year, but because of several “critical” decisions that had to be made – the first being the future of the Durban International Airport site. If this was purely up to him, the site would be used mainly as a dugout port. Should this happen, he said it would require a R300 billion investment over the next 15 years. “It is a decision that needs to happen this year. All the work done to date points towards three things, the first being a dug-out port on (most of) the land… as Durban is the only place in Africa that can become a ‘super port’. There is no site as strategically important as this one and no other site can have an impact on the economy of southern Africa like this one can,” he said. A second option was for the city to relocate some industries from residential areas in Clairwood and Merebank to the airport site. The third consideration was to merge two existing fuel refineries into one bigger refinery as a result of Transnet’s new multifuel pipeline that runs nearby. Apart from this, Sutcliffe said it was important for the city to decide whether it was worth bidding for the 2020 or 2024 Olympic Games. “In the next month or two we need to look seriously at it. It has to be part of a national development plan. With the new minister (Sports Minister Fikile Mbalula) it will be useful to start seeing his view and that of the cabinet in terms of whether that (the Olympics) is part of our 10-year plan. “It can’t be seen as a purely local initiative, it’s too costly as an event. Even if the country wants to go ahead with it, as a city you need to be very careful. We need to be factual and honest in our reporting on it and its benefits. There are social issues, environmental issues, economic and financial issues that need to be considered – it’s not just financial,” he said, adding that any risks needed to be mitigated. Sutcliffe said the decision would have to be made before the International Olympic Committee (IOC) meets in Durban in July. At that conference, Durban would have a chance to showcase itself as a potential host city to the IOC’s voting delegates and to other influential figures. However, it is the United Nation’s climate change conference in December which, for Sutcliffe, is the most crucial event in Durban this year. 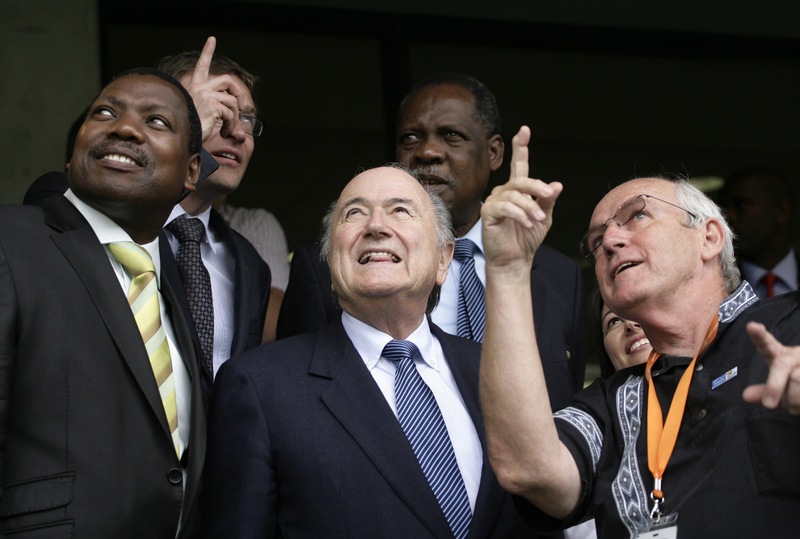 He described it as being “important for the city and for the world… It is probably more important for us than the Fifa World Cup – not to diminish the World Cup, but in the end, the World Cup is just an event”. “The significance of the climate change conference is that our very existence on this planet could be determined by whether or not a deal is finalised at this conference,” he said. “The climate change conference is the big one,” he said. About 30 000 to 40 000 delegates, including heads of state were expected to attend. But before then, Sutcliffe will have to deal with local government elections and find out if he will, in fact, still be at the helm of the city. MUNICIPAL manager Michael Sutcliffe has recently shed 15kg, started cycling twice a day and hitting the gym three times a week. It’s almost as if Durban’s most controversial man is getting into fighting shape for the six months ahead – possibly the most crucial of his career and the city’s future. While shedding a few more kilograms would be a welcome distraction from his acrimonious divorce from his wife of long standing, Felicity, at the forefront of Sutcliffe’s mind will be finalising the city’s multibillion-rand budget, upcoming local government elections and two major international conferences. And this while still being uncertain over whether his contract as city boss will be extended beyond July. Sutcliffe would not say whether negotiations had taken place over his future. “This is an issue the ANC will discuss with me at an appropriate time. The ANC isn’t an employment agency, so Dr Sutcliffe has not got an appointment with the ANC to chat about his job. What would need to happen – and what is happening now – is that the ANC would have to look at the political and administrative transitions…over the next three, four or five years, and what the plan will be,” he said. Asked if he wanted to continue in his job, Sutcliffe was emphatic. He added later in the interview that he would like to assist in governance at some level “for as long as possible”. Speculation is rife over who will replace Sutcliffe when he does eventually step down, but he would not talk about any grooming within council, or who his successor might be. “I don’t get involved in personal discussions around that. The media always says, ‘If Michael goes, who replaces Michael?’ It’s not about who the individuals are. It’s not a Michael Sutcliffe discussion. The media shouldn’t turn it into that. “I’m not applying for a job. It’s not like I’m walking around with my CV in my hand. And equally there are not people in my management who are thinking like that,” he said. Should Sutcliffe not stay on as municipal manager, there is widespread speculation that he would take up a key position in the city’s possible 2020 or 2024 Olympics bid. 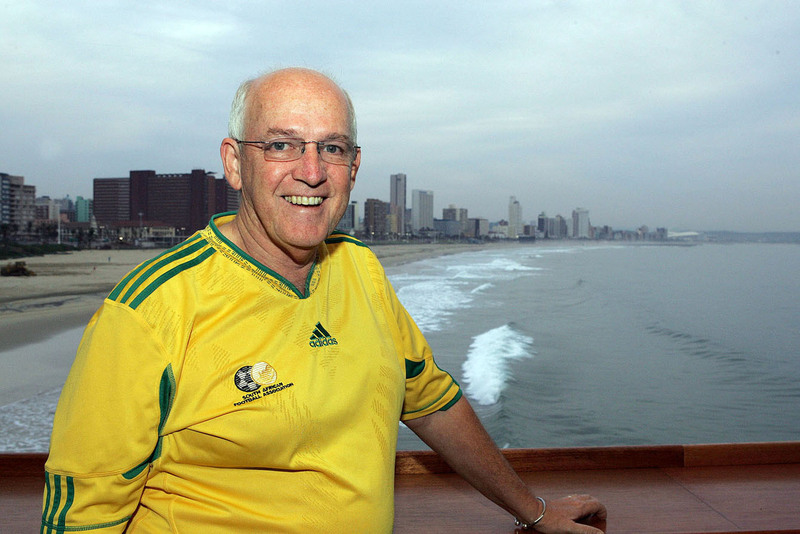 divided into two parts, the first being led by the country’s president, Jacob Zuma, and by SA Olympic Committee boss Gideon Sam, who would have to convince voting International Olympic Committee members to bring the Games to Durban. The second part was where he would come in. “If we happen to bid, then our city would obviously be involved and I would be involved in that sense. I would have strengths in certain functions, but not in others. I’m probably not diplomatic enough, because I don’t like corruption (and) I don’t like some of those things, like having to wine and dine people. I’m not necessarily that type of person. “There are other things I can do, like developing presentations and arguing our case and that type of stuff. You’re going to have to have pretty big teams. I’ve looked at other bid teams and they’re very diverse,” he said. “I am probably not diplomatic enough, because I don’t like corruption” This has to be a mis quote surely! There are so many investigations taking place into eThekwini re corruption in many forms and he has had to know about it. Furthermore, if you are the head of an organisation, such as he is, you cannot plead ignorance as to what is happening under his very nose. That is plain stupidity!! If you like what I have to say...follow for more madness and method.